"R K Enterprises", has commenced operations as a Proprietorship owned organization, Established in 2004. We are engaged in wholesaling, distributing, trading and supplying a huge assortment of Audio Equipment and Accessories. Our offered products are Sound System, Audio Speakers and Audio Mixing Equipment. Our products are admired for their unmatched attributes such as outstanding performance, technically advanced, precision engineering, high operational efficiency and others. To develop these products, our vendors have adopted latest techniques and methods of production, which makes the entire gamut exclusive and best in terms of reliability, quality, efficiency, performance and longer functionality. Apart from the most important factors mentioned above, we pass our entire gamut through a series of quality tests, which are being performed by our skilled professionals. We trade in JBL, QSC, Dolby, BARCO, Datasat, Harman Group Products, Christie and many more brands. We also provide Maintenance & Installation Services. We have built a sound and state-of-the-art infrastructural facility, where our all operations are performed in an organized way and we are able to accomplish the set targets within predetermined time. Our infrastructure encompasses departments such as quality checking, logistics, sales and marketing, warehousing and packaging and many more. We are authorized Distributor of Behringer and Bugera. Our company performed all its business tasks properly under the intelligent supervision and guiding principles of our Proprietor, "Mr. GSRKS Prasad". He led the organization to grow and sustain an enviable niche in industry, for which, the credit goes to his rich industrial experience, administrative skills, managerial abilities and farsightedness. Being a quality conscious name, we believe in making a long lasting association with our patrons by providing them with the best quality audio equipment at cost effective prices. 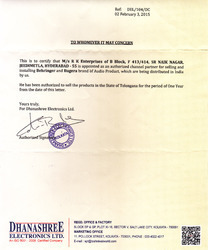 For the purpose of ensuring the best quality, we procure the offered range of audio equipment from authorized vendors. Before we accept any products from our vendors, we check all the products to ensure their flawlessness. We are honest, sincere & dedication in our business. What we say, we do that. What we commit, we stand by that. We extend all possible services promptly. We have come up in our business on these basics. Owing to our rich vendor’s base, we have been able to meet the bulk demands in the most efficient manner. Hold expertise in their area of work, our vendors make use of quality assured material and latest while developing the offered range of audio equipment and accessories. 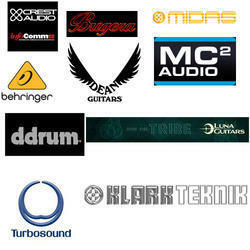 We are authorized Distributor of Behringer and Bugera. Our team consists of hard working and dedicated professionals, who work in close coordination with each other, to ensure that all the on-going processes are carried out in the most streamlined manner. For avoiding any hassles in the workplace, we work in close coordination with each other and follow customer centric approach. Moreover, we train our professionals, to enhance and polish their skills. Large production capacity of our vendors has helped us in meeting the bulk demands in the most efficient manner. Quality assured range of audio equipment delivered within the assured time frame, has helped us in attaining the trust and confidence of our patrons. We accept different modes of payment such as cash, credit card, and demand draft, to meet the expectation, ease and budget constraint of our patrons.